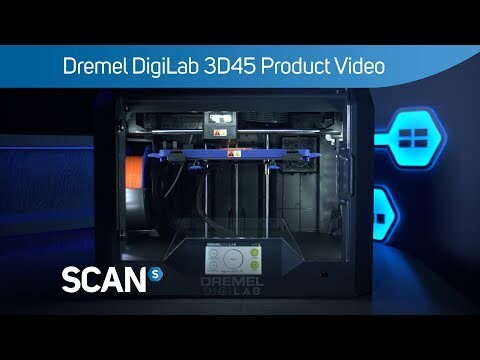 VERSATILE HIGH PERFORMANCE 3D PRINTERThe Dremel DigiLab 3D45 3D Printer is equipped to handle major printing tasks you throw at it. This printer is designed to be able to create high quality 3d prints with minimal mishaps. The printer can prevent the warping effect that most other 3D printers have, a problem that is avoided by including a heated bed and cooling fans within the printer. There is also an easy filament mechanism that can accommodate for multiple materials and a RFID recognition system that automatically changes print settings accordingly. Included features such as a fast and accurate calibrated semi-automated levelling bed and ease of life features such as minimal noise and a HD camera to monitor the prints remotely, the DigiLab 3D45 is a printer designed to produce high quality prints easily. DESIGNED FOR VARIOUS OUTLETS The 3D45 provides the flexibility and reliability needed to meet the demands of higher education, makerspaces and industrial workplaces that benefit from advanced FDM 3D printing. Whether your lab is developing prototypes for innovative biomedical devices or sculptural works of art, the 3D45 quickly produces accurate print models in a safe, easy to use package. STRESS FREE FILAMENT USAGE The Dremel 3D45 printer comes with an improved extruder that minimises distractions and downtime. The extruder is designed to fit all Dremel filament materials without the need of changing any parts before operation Also changing from one material type to another is done in no time thanks to the integrated RFID recognition technology. It automatically adjusts the printer settings according to the filament type being used and eliminates the need to re-slice files for each type of filament. ENHANCE THE POSSIBILITIES OF 3D PRINTING The DigiLab 3D45 is a 3D printer that can tackle more demanding, advanced filament types at higher temperatures like nylon, polycarbonate, PLA, and Eco-ABS — a form of ABS manufactured in an environmentally sustainable manner. With a heated bed that allows advanced types of filament, such as Eco-ABS and Nylon. Eco-ABSA modified version of PLA that offers the same high detail finish but with added strength and durability. NylonNylon is a synthetic polymer perfect for printing strong and flexible 3D prototypes with heavy wear resistance. PETGA thermoplastic filament that combines the strength of ECO-ABS, the flexibility of Nylon and the usabilty of PLA. PLADremel PLA filament has been specifically engineered for optimal printing with your Idea Builder. YIELD BETTER PRINTING RESULTS MORE OFTEN The combination of improved attributes provides the users even better 3D printing results with the same ease of use. The innovative extruder now allows a print resolution of 50 microns. Together with the added filtration system, the enclosed 3D45 prints its layers whilst remaining protected from all dust. All that while the temperature is consistently kept at an optimal level and prevents the printed object from warping thanks to the heated bed and improved cooling system. Avoiding failure prints, the 3D45 furthermore incorporates smart sensor technology, allowing effortless, accurate calibrations, and easy set-up. STAY CONNECTED WITH YOUR 3D PRINT JOB With the integrated camera, users have the ability of monitoring their printing project: teachers for example can track the three-dimensional printing in real time with their students by accessing the camera's IP address. Thanks to the WLAN function, users can also start their prints remotely. 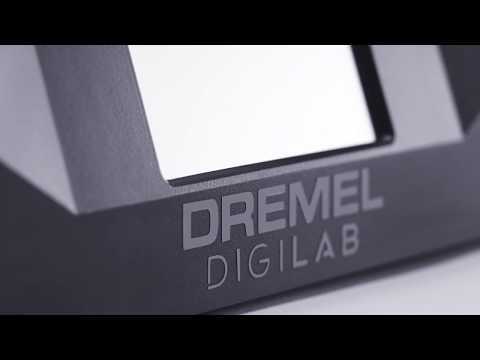 To allow users to move quickly and easily from design to the printed 3D object, the DigiLab 3D45 offers the new "Dremel DigiLab 3D Slicer" software for convenient and intuitive slicing of the print file. Dremel DigiLab 3D45 3D Printer, Enclosed 0.4mm Single Extrusion, w/ PLA/PETG/Eco-ABS/Nylon Support, Camera, Touchscreen is rated 2.0 out of 5 by 1.